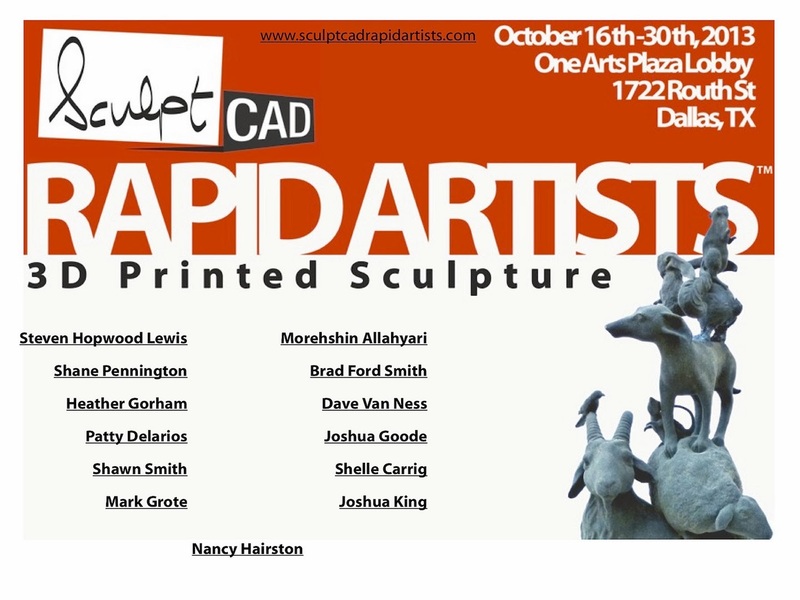 The SculptCAD Rapid Artists Project was organized by Nancy Hairston in 2010 as a way to showcase the versatility of rapid prototyping 3D printing. Each year she has asked artists to come to the SculptCAD offices and learn how to use this technology, then make some art. The SculptCAD Rapid Artists 3D Printed Sculpture show at the One Arts Plaza is a quick sampling of some of the artwork that has been produced over the years. This show was presented to dove tail with the Aurora Dallas event. Artist in the show are: Steven Hopwood Lewis, Shane Pennington, Heather Gorham, Patty Delarios, Shawn Smith, Mark Grote, Morehshan Allahyari, Dave Van Ness, Joshua Goode, Elliot Johnson, Shelle Carring, Joshua King, and myself, Brad Ford Smith. Below are a few snaps from the exhibit. Brad Ford Smith - Servings is a nod to the Balloon Dog sculpture by Jeff Koons. Heather Gorham - Is it a circus trick or a view of the universe? Elliot Johnson - Hellbender, a salamander with self-esteem issues. Shane Pennington - Pushing the binderies between art , technology and nature with his living bonsai tree with spliced in resin print.